I bought this on Ebay not long ago and it arrived today. Only had a quick mess around so far but I'm very impressed with the sounds. 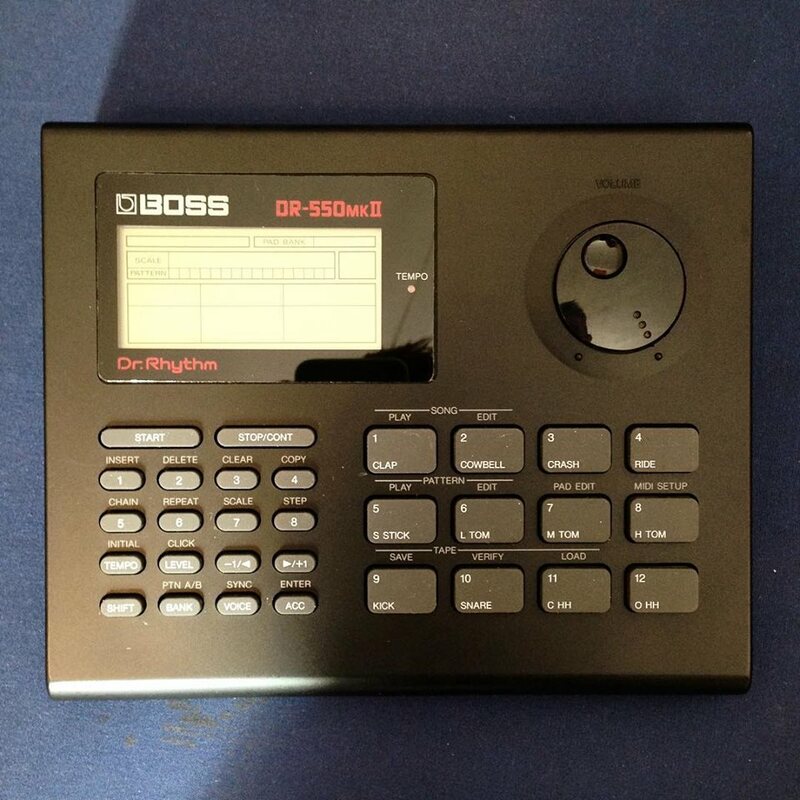 I've got essentially zero experience with drum machines (hardware ones, anyway), but once I've figured out how to programme this thing (which could take a while, admittedly) I'll be attempting to use it as part of a live band. Does anyone have any PRO TIPS? I've got the mark one version of that. I think they were fairly similar but the mark two had a lot more sounds. Haven't used it in many years but from what I can remember it was easy enough to program in either step or real time mode. I certainly found it easier than the DR-670 I bought later on but that may just have been a personal thing as I was used to the DR-550. Think I often used to do a bit of both i.e. program the kick and snares in real time and then add the hi-hats in step mode. Assign your snare of choice to two of the pads and then set them with different volume levels. The pads are not touch sensitive but doing this allows you to get more realistic and less mechanical (which admittedly may not be what you are after) rolls and stuff. You can't program a song to change tempo midway through but you can chain songs together so you could program the first half of your song as song 1 at 120bpm and then the second half as song 2 at 130bpm. If you then chain them together (think it was called "chaining") it'll play them in sequence and you'll get your tempo change. I think the mark two may have had more memory than the mark one but I used to have to back things up using cassette tape (the file sounded a bit like a Spectrum game loading IIRC) as you couldn't store that many songs. This obviously gives it added hipster credentials. Re playing live, I never did with mine as the various bands I gigged with always had a drummer but my best mate and I did record a couple of albums with it back in the early nineties. Might be rose tinted spectacles and all that but I actually have pretty fond memories of that drum machine. Might dig it out for a play at the weekend. Cheers BearBoy! I was under the impression that I'd have to step-programme everything, so it's good to know that you can programme in real time as well. I'll report back once I've experimented a bit more. For live stuff this won't be instead of a drummer, but as well as. In one of the new bands I've started we're kind of exploiting some of the contrasts between ~on-the-grid~ programmed/synthesized stuff and actual human musicians. So for example there's one song where 90% of it has a bass guitar and a sequenced synth bass playing the same part in unison, and at the points where they divert away from each other it has this ace stomach-turning quality. And there's another song where the synth part loops for the whole thing, but it's playing in a different time signature for the whole song so it sits differently on the groove each time it happens. We're wanting to try some similar stuff with drums. I have that one, it's pretty cool. Haven't used it in a while though. Set up your sounds first, you get more than 1 "page" of those pads. There are some good TR-808 sounds and percussion in there too. But there's more sounds than available pads, so you have to set it up. Also I think you need to keep batteries in to hold stuff in memory. You can backup to computer instead of tape if you want, but you have to be careful with the level when you record the backup.